At this week's TechCrunch Disrupt, dozens of startups fought, tournament-style, to impress judges and investors. Here's our pick of the 5 coolest new technologies on display. In a field filled with Web-based and mobile apps, Soluto stood out starkly. It's old-fashioned, runs-on-a-computer software. But the startup trounced all others by tackling a universal problem: PC troubleshooting. To pull that off Soluto created PCGenome, a global knowledge base of "PC frustration data." That database can help users track down tricky hardware/software conflicts, a feature judges loved. 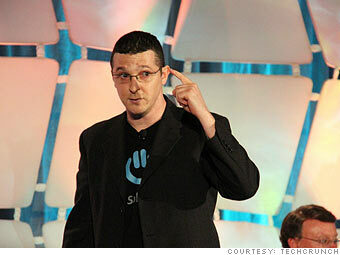 "When we launched Google Desktop, we had a conflict with photo software on HP PCs. Took 2.5 months to track it down," Google's Marissa Mayer commented. But the judges were very concerned about privacy, asking Soluto's inventors for details about what kind of data they're collecting from as their software hums away on PCs. "We don't want to know who our users are," Roee Adler, Soluto's chief product officer, insisted. The software requires no registration and keeps the technical details it collects anonymous. Soluto, now in beta, plans to use a "freemium" business model: When Soluto pops up with a troubleshooting fix, users will be able to make the fixes themselves for free, or they can pay for a service that will automatically fix problems.  Tech startups: Go big or get bought?